Apologies first to southern hemisphere readers and those who don't get much time off work in the school holidays. I know I'm blessed, spoilt and sound smugly annoying to have just started six weeks holiday. My boys are both having their own holidays without us this year and Tim and I have just had three days away in Swaledale, North Yorkshire. We also have two weeks at home together. But what do I do with the time in between when the family are either working or doing their own thing? Most of my summers start off with good intentions along the lines of: get more organised, complete major decorating projects and, in a bottom-of-the-list type of way, make more time for myself. Ha! Like that's ever going to happen! It's no surprise then to hear that by the end of the school holidays I'm usually exhausted from trying to fit too much in and generally feel angsty that I can't keep on top of it all. This year I'm determined to look after myself. You know that nugget of advice that if you look after yourself then you're better placed to take care of others - well it's time to give it a try! I decided to make a list of things that I really want to do with my time. Not things that I think I should do. No. Things that'll make me feel happy as I anticipate them. Things that'll make me healthier because I'll feel more balanced not slimmer or clearer skinned. A few indulgences that wouldn't be in my usual budget but are a one-off reward to myself. Here's my 'bottom-of-the-list' summer list. It's in no particular order. I've tried to make my list fun, as specific as I can and impossible to finish. I'll still have domestic tasks to attend to, a kitchen that needs painting and I'd like to declutter more of our paperwork but these will not be my priority. This summer taking a few hours each day for myself will always be towards the top of my to-do list. Minimalism is all about having the freedom to choose how you spend your time after all. Finish reading books that got abandoned because of book club deadlines. How could I not finish The Goldfinch when I had less than 100 pages to go? Read unread books on my bookshelf. I had quite a lot of books for my birthday (see photo). Which to read first? Any recommendations? Read independent magazines. I bought The Simple Things for the first time for our trip away at the weekend and I would like to try others. Any suggestions? Cook from recipe books not the internet. Have a summer pj day and catch up with films. Eat fresh avocados because I love them and they're healthy. Make homemade guacamole (avocados again I know). Visit a cafe alone to write. Learn the basics of hand embroidery. Eat ice cream once a week. Put edited photos in new photo albums. Have an eyebrow and eyelash tint. Actually buy something from a farmer's market. Give myself a weekly manicure. Learn the words to a favourite song so I can sing along. 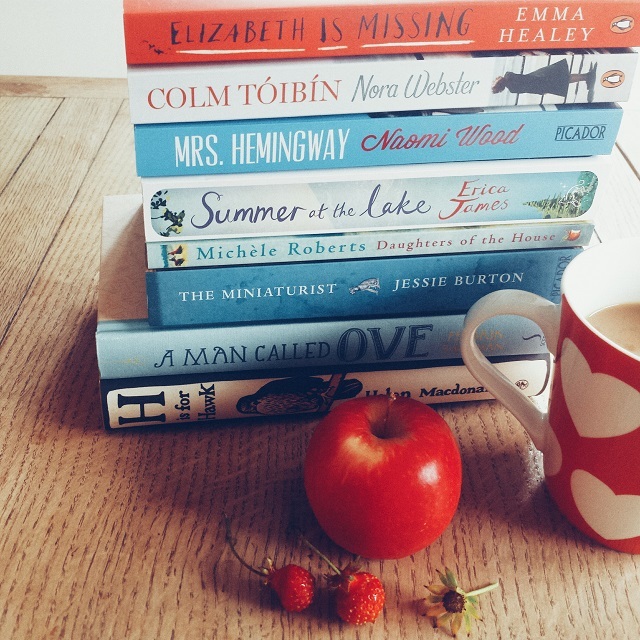 Take part in Susannah Conway's The August Break on Instagram. Go on a train journey to somewhere new. Eat a simple meal of bread, cheese and wine in the garden. I could go on but I'll stop here. Do try writing a 'bottom-of-the-list' list. It's really fun. And of course you can do this in the southern hemisphere and in your time off work too. I'll update you on my progress along the way. Go on indulge your imagination and your soul. What's on your 'bottom-of-the-list' list? Do your projects and interests always come bottom of the list? Please share. Working too but giving myself 6 three day weekends so should fit some of those bottom list kind of things. Summer at the Lake sounds like an appropriate read. Some lovely ideas too. Like you I have the long summer break and looking forward to lazy mornings of reading in bed before I tackle list of dull household tasks. Have read a few of your books. I really liked Nora Webster and Elizabeth is Missing. The Miniaturist is also good but it takes a while, a bit like The Goldfinch and was a bit low on plot for my taste. Claire it's a great idea to create a list to prioritise those things we'd like to do but which end up being overwhelmed by bigger and seemingly more important stuff. Top of my bottom-of-the-list Winter list is to sit on the sunny balcony and read (currently a biography of Marcel Proust by William C. Carter which I recommend if you like biographies) or watch the activity on the bay. I'm in the middle of The Goldfinch right now and am also marveling that you didn't finish it, being so close to the end! I've just loved the book so far. Hopefully you liked it too. Sounds like you have a lot to look forward to! Go on a train journey to somewhere new - yes!! it's so fun to just skip off on a train and explore, a feeling of freedom, no car to worry about, and a great way to have a minimalist day out with a packed lunch or take away and a camera to snap those odd moments you would miss if you were in a hurry! free people watching, sunshine. What a great list! Since drip/filter coffee isn't always available in the UK, I always have flat whites when I am over there! I read H is for Hawk and found it very serious indeed, but perhaps relate-able for someone dealing with profound grief. Excellent idea. Oh please finish The Goldfinch; a lot happens in the last 100 pages. I love your list. You have inspired me to write my own. No long summer break here in Australia but we are having lovely dark, rainy weekends which provide the perfect setting for pottering. Enjoy your break Claire. My thing for this Summer is to not have a list!! I have enough to do in the day to day that I am just pushing to get it done and then doing whatever inspiration makes me do. Yesterday for instance I downed tools earlier than usual and sat with coffees (one after the other) and watched a few episodes from a boxed set I've been itching to get into. The dogs loved it and cuddled up on the sofa with me, it was just a lovely, lovely evening. A Man Called Ove was 1 of the few books everyone in my reading group enjoyed. May I suggest you move it to the top?